TB is a common infectious disease caused by Mycobacterium tuberculosis, affecting a number of organs, most commonly the lungs. The causative agent of tuberculosis Mycobacterium, open R. Koch in 1882, belongs to a group of acid-fast. 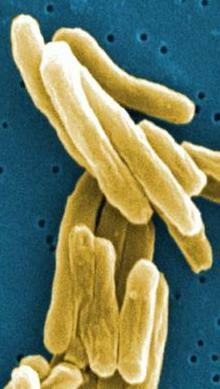 Mycobacterium tuberculosis is a thin stick, often slightly curved, with slightly rounded ends, length from 0.8 to 3-5 microns and a width of 0.2 to 0.5 microns (Fig.). There are several types of Mycobacterium tuberculosis: human, bovine and avian. Recently produce atypical mycobacteria. The main source of the infection are the TB patients people that produce sputum Mycobacterium tuberculosis; infection is also possible when using products from tuberculosis of animals. The pathogen can be transmitted by airborne droplet, and airborne dust, nutritional and contact ways. Morbidity and mortality of tuberculosis depends mainly on social factors, the level of development of medical science and health care. After the great October socialist revolution morbidity and mortality from TB in the USSR as a result of social transformations and special events have started to decline, especially it has been celebrated since 1950, there have Been significant changes in the character of tuberculous lesions detected in infected people. Rarely have to meet such severe diseases as miliary TB, tubercular meningitis, caseous pneumonia. Many times decreased mortality from TB among children. 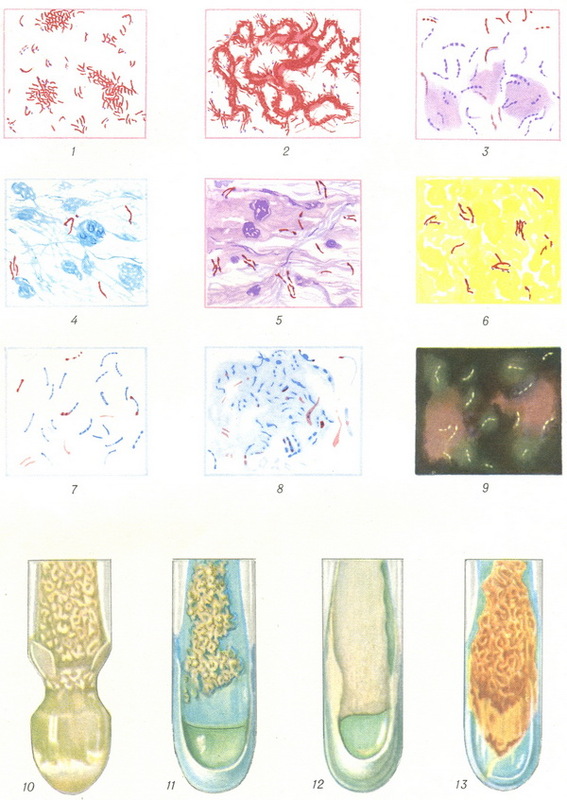 Mycobacterium tuberculosis: 1 - in pure culture; 2 - in the culture of liquid media (expressed location "spits"); 3 - in sputum (color on the Fly), and 4 - in the sputum (painting by Zn Nelsen); 5 - in the sputum (colour on a Fly-Weiss); 6 - in the urine (color on Spengler); 7 - nikelacoste mycobacteria and separate dipteronia sticks; 8 - atypical forms (with kolloidnyi swellings and others); 9 - by fluorescent microscopy; 10 - colony on glycerin-potato environment; 11 - colony on a solid egg environment; 12 - bird colonies type solid egg environment; 13 - orange culture on solid egg environment. It is established that the penetration of mycobacteria in the human body have not necessarily mean the development of TB. The organism responds to the invasion of Mycobacterium mobilization of protective forces, phagocytosis, production of antibodies, inflammatory reactions. Often Mycobacterium long time remain in the body without causing specific inflammation. When this occurs in the lymph nodes macrophage limfoadenopatia and plasmacytoma reaction as a manifestation of antibodies in response to the introduction of the antigen (toxin mycobacteria). However, in violation of immunological status and the failure of protective forces of the organism Mycobacterium manifest their pathogenic action, and develop tuberculosis as a disease. From the moment of infection and before the development of tuberculosis sometimes it may take a very long time. In some cases, the disease is on the background of allergies (hyperergic) and weak immunity, others have observed an inverse correlation, or sensitivity to TB toxin and immunity to tuberculosis how would remain at the same level. All this is reflected on morphological manifestations of TB, its clinical course and creates an extraordinary polymorphism, variety of clinical and morphological manifestations of the disease. Immunity with tuberculosis, relative, non-sterile and is supported by the presence in the body viable, but malevolently bacteria. When the infection, and the disease is changing reactivity of the organism, especially in children. Increased sensitivity of the organism - Allergy - determines the development of the disease, and in favourable cases is gradually giving way to the immune system, which in the future the basis of cure. Tuberculin diagnostics. To identify allergies apply intradermal the Mantoux test and skin test Pirke. For statement of tuberculin tests produce ready-to-use part of the solutions of (PPD tuberculin purified dry-glycerin extract broth cultures of mycobacteria) activity 5 tuberculin units (5 TE) in 0.1 ml of Intradermal injection of tuberculin (see) are produced on the outer surface of the upper third of the right shoulder (after pre-treatment of the skin 70% alcohol) special tuberculin or adenohromovykh syringe. Leather shoulder fix your left hand so that it was tense, then a short, thin needle is injected into the thickness of the skin parallel to its surface, i.e. strictly intradermally. This section of the needle and calibration of the syringe should be facing up. Enter 0,1 ml PPD; with proper test in the skin is formed of white pimple sized 5-8 mm in diameter. Check the response of the Mantoux test is performed within 48-72 hours and is considered positive if there infiltrate not less than 5 mm in diameter. Redness around the infiltration, is ignored. When setting the sample Pirke to clean 70% alcohol skin of the forearm put a drop of the solution PPD and in its place is a notch-scarification of the skin pox feather, and then drop allow to dry up. The reaction should be considered positive in the presence of infiltration by not less than 5 mm in the direction transverse to the skin smooth finish (Fig. 1-3). Fig. 1-3. The tuberculin skin test Pirke. Fig. 1. The negative. Fig. 2. Moderately expressed. Fig. 3. Pronounced. Positive and strongly positive reaction confirm the existence of sensitization of the body, and the negative tuberculin reaction may indicate the absence of disease or the cure. In case of severe disease negative tuberculin reaction may indicate a depletion of the protective forces of organism.